Muslims see this and say Jesus was despairing because God had forsaken him. First of all, these words were spoken by Jesus when He was on the cross. Next, do you know what Psalm 22:1 says? Of course, those who actually know this Psalm will realize that I was referring to a particular verse. In those days, Scriptures had no chapter numbers or verse numbers. 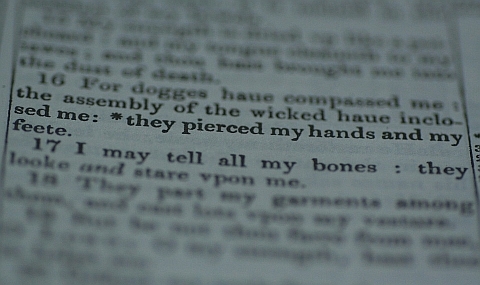 If I was going to refer to a particular Psalm, I would do it by reciting the first line of the Psalm. People who hear it, and who are familiar with scriptures would then know which Psalm was being referenced. The intelligent question to ask is: WHY was Jesus quoting Psalm 22? I have never heard a single muslim who has ever ask this. In fact, how many Muslims have even read the whole of Psalm 22, at least out of curiosity, to see why Jesus spoke of this Psalm while He was on the cross? What was so important in this Psalm? Only one way to find out. Read it.